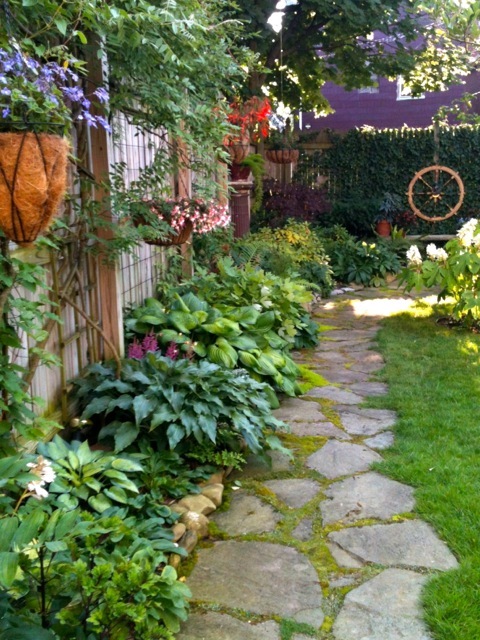 This past summer I went on the Parkside Garden Tour. 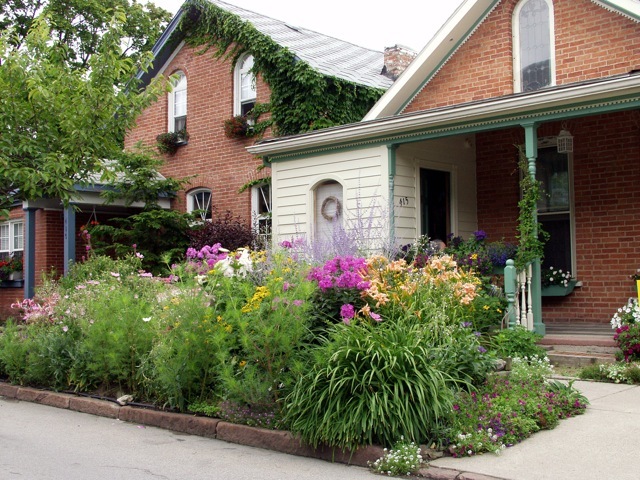 The Parkside area of Buffalo was laid out by Frederic Law Olmsted and includes every style of house you can imagine, from simple four-squares to grand Victoriains to Frank Lloyd Wright's Martin House (the house he considered his "opus"). 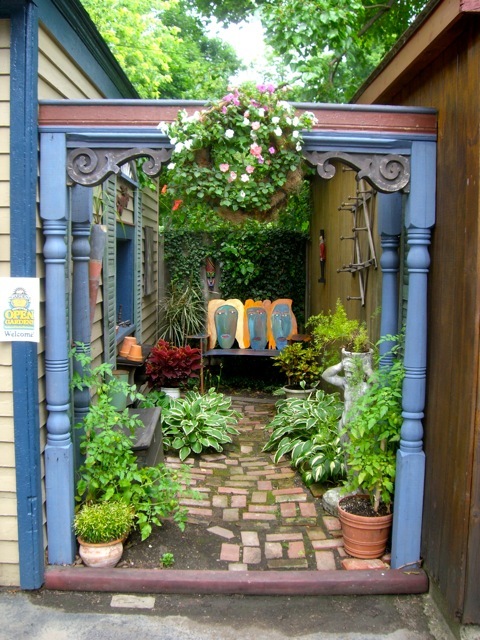 My favorite garden, of the few that I managed to see, included this pretty little alley between two garages. The space between detached garages, in urban settings, is usually a dead space, used more often for storing junk - scrap wood, piles of bricks, old tires and garbage cans. And the areas are notorious for having little light, lots of weeds and harbor for insects & rodents. Not here. 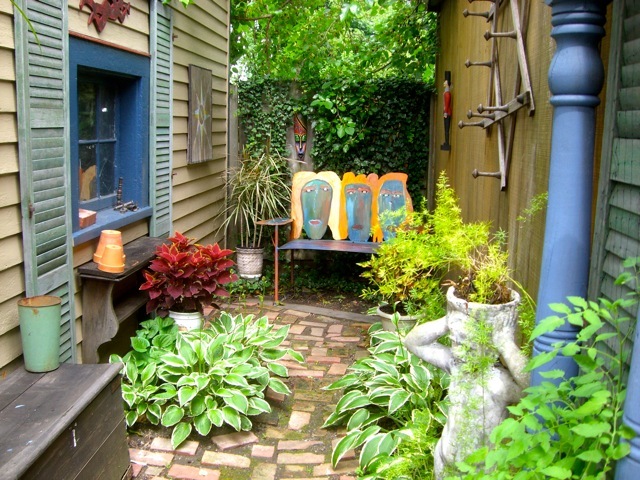 The least-used space on this property was made one of the prettiest – mostly with extra stuff garages collect over the course of time -- used brick, old wooden pillars, scrap lumber, buckets for planters, and odds and ends. Those and a good dash of creativity and color. 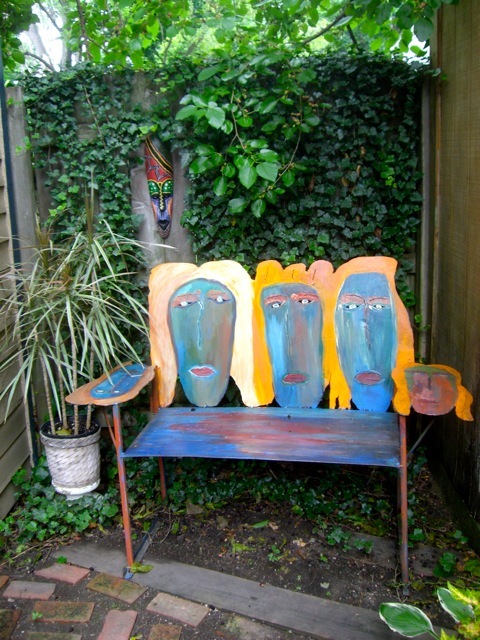 The featured piece is this painted metal bench. Dark ivy backdrop makes the bench scream. 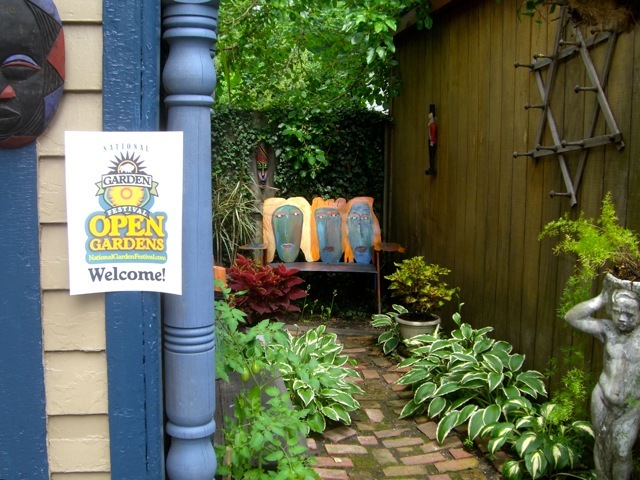 Garden Festival's Open Gardens - open to the public on Mondays and Thursdays for five weeks. 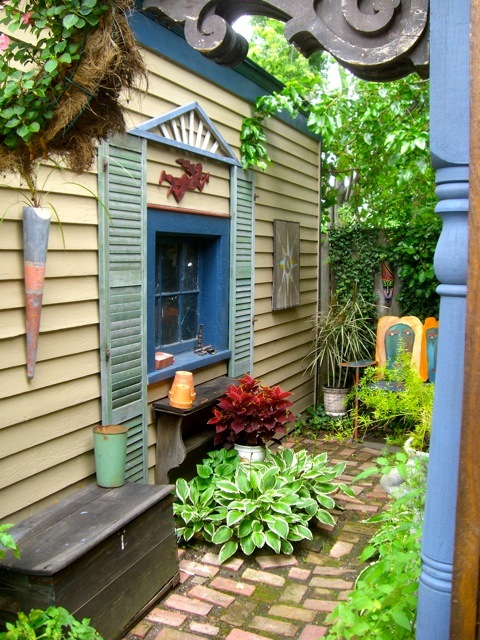 Old shutters, found objects as artwork, and color. lots of color. Makes me wish I had a throw-away space like this to surprise visitors and flex some creative muscle. What a nice area created here. Love all the colors. I too visited Parkside and missed this little gem. Thanks for taking me back for a second look. I'm always amazed and inspired by people who can turn a difficult space into a showcase. I could go on & on about how much I love this little garden. It's cute but I can't help but wonder if it is ever used and how it is used. Those are some great pictures. It gives a really inviting and small town feel. I love this an an arbor. If I had the room, I'd definitely do something similar myself. I wonder if they spend any time in this nook sitting though. Thank you so much for sharing these elegant original art beauty with us. I really feel good after see this.